We conducted our annual electrofishing sample in Dry Run Creek on August 8th. During the sample, we collected several large fish with what appeared to be angler-made notches in their tails (see attached picture). We have heard of folks doing this to "mark" trout as ones they have caught previously. We strongly advise against the practice of doing so. Injuries of this nature can cause infections in the fish and ultimately lead to their death. The additional stress of handling and clipping can also negatively affect the fish. 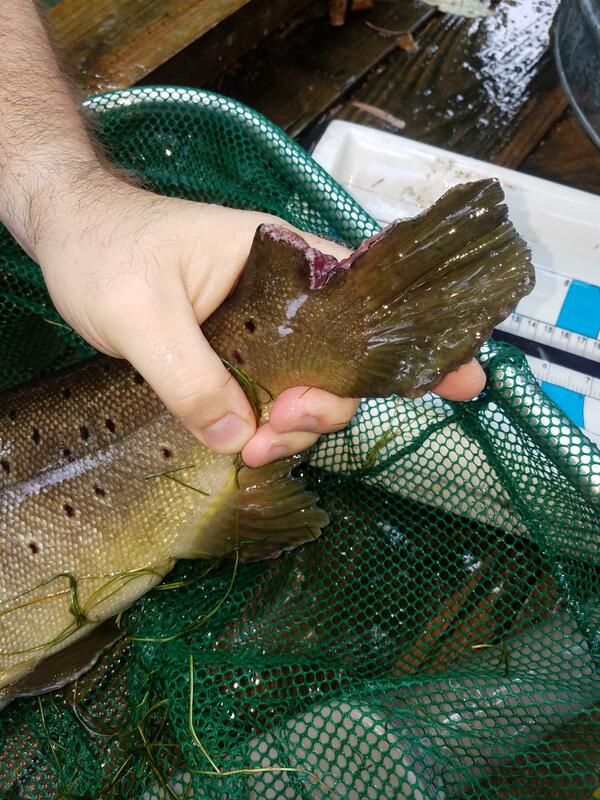 Please leave trout marking up to us, which is typically done in a controlled setting, while fish are sedated, and their condition is monitored for several weeks prior to stocking. Some peoples kids. I guess when and if they are caught at each transgression the offenders should loose a finger or two without a doctor. Wasn’t there another post about notched tails on here before? I was trying to remember that too Snagged. There was quite a long discussion about bass in Stockton showing up with broken jaws. Weren't the broken jaws due to boga grips? This is intentional and it's parents teaching their kids that this is ok to do. Very sad. Might as well toss them in a basket and take them to the skillet. Its a crime. That is a catch and release area. Release unharmed, gently. I believe it was guys marking smallies on one of the rivers. Clipping their tails in a similar fashion. Why the heck would you even begin to want to do something like that?